On MR Angio, if Diffusion and FLAIR does not show any infarct and single sided vertebral show poor flow related signals or not visualised we may pass it off as hypoplastic vertebral. 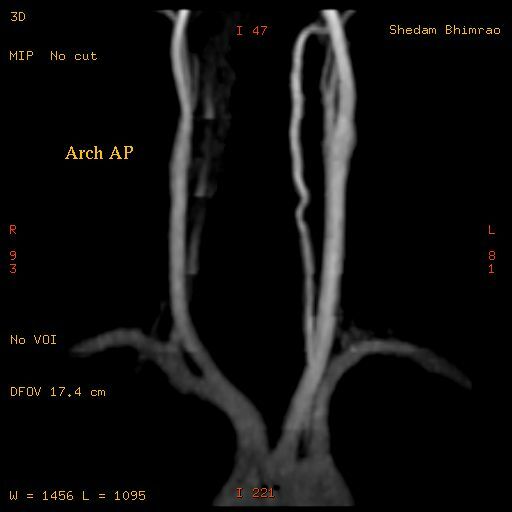 But what if diffusion show recent infarcts in posterior circulation territory as in this case. MRI Brain Dw images show multiple foci of recent ischemia with restricted diffusion involving bilateral cerebellar hemispheres. Right vertebral show poor flow related signals on MR Angio. You can try axial thin Fat sat T1sections in the region of neck to cover vertebrals. Abnormal high signals in the region of right side vertebral with loss of normal T2 flow voids compared with opposite left vertebral and ICAs which show normal T2 flow voids. 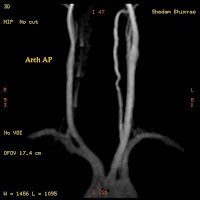 The high signal intensity on Fat T1 can be attributed to blood clot possible with thrombosis / dissection of vertebral artery. The same protocol is applicable to carotids.